Information: This color composite made from Voyager 2 narrow-angle camera frames shows the Great Red Spot during the late Jovian afternoon. North of the Red Spot lies a curious darker section of the South Equatorial Belt (SEB), the belt in which the Red Spot is located. A bright eruption of material passing from the SEB northward into the diffuse equatorial clouds has been observed on all occasions when this feature passes north of the Red Spot. The remnants of one such eruption are apparent in this photograph. 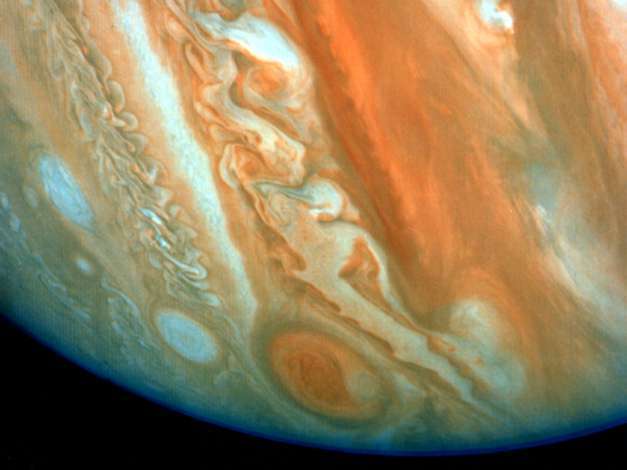 To the lower left of the Red Spot lies one of the three long-lived White Ovals. This photograph was taken on June 29, 1979, when Voyager 2 was over 9 million kilometers (nearly 6 million miles) from Jupiter. The smallest features visible are over 170 kilometers (106 miles) across.